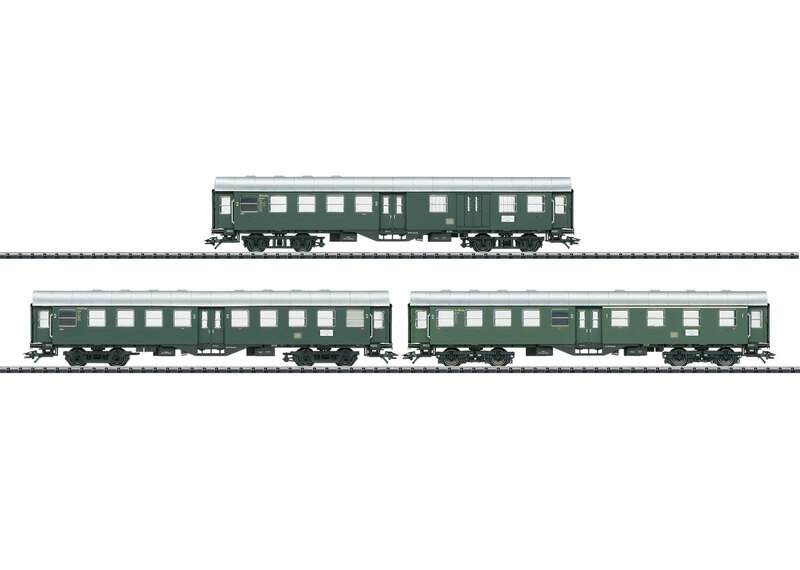 Prototype: 3 different German Federal Railroad (DB) 4-axle passenger cars. Type AB4yge "Umbauwagen", 1st/2nd class, type B4yge "Umbauwagen", 2nd class, and type BPw4yge "Umbauwagen", 2nd class with a baggage area. The cars look as they did around 1958/59. Model: The 2nd class "Umbauwagen" with a baggage area has Prussian standard design trucks, the 1st/2nd class "Umbauwagen" has Minden-Deutz design trucks, and the 2nd class "Umbauwagen" has American design "Pennsylvania trucks". Each car has factory-installed LED interior lighting and electrical wheel pickups. A decal set with different car routings is included for each car. Length over the buffers per car 22.4 cm / 8-13/16".